Whether you want to keep pesky insects out or cold air from infiltrating the warm room, the Berner 36 in. 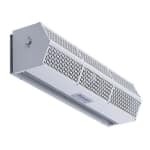 K-Zone air curtain is just what you need! The (1) 1/5 motor releases unheated air and is made for doors up to 7 ft. high and can be mounted either on the interior or exterior of the door frame. Additional voltages are available at no extra cost and you can contact customer service at 1-800-541-8683.